Had to pick Liz up at 3 pm and then go back up to Severn to get grace from practice. Made it down to beach around 6. The wind finally changed direction and was blowing alot of water into river...combined with full moon, the water was very high. 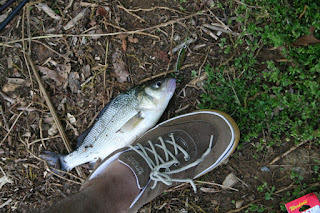 Picked up a good size WP on Kastmaster, but no Stripers. 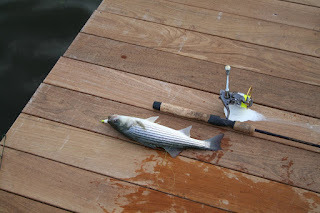 Could see alot of baitfish jumping over by Marina, so I headed down there after dinner and FINALLY picked up the first Striper of year. Caught on white curly tail with yellow jig head. No topwater action, but at least I know they have arrived.